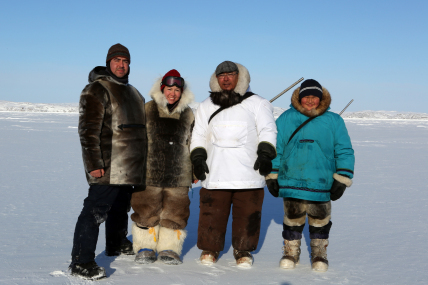 Also known as "Inuk en colère"
"In her film Angry Inuk, Inuit director Alethea Arnaquq-Baril joins a new tech-savvy generation of Inuit as they campaign to challenge long-established perceptions of seal hunting. Though most commercial sealing is conducted by Inuit in the Arctic, anti-sealing activism has created a perception of the industry that denies their central role in the sealskin market. To reinsert themselves into the international discussion, these Inuit activists must inconvenience the fundraising campaigns of animal groups by using all the tricks in the social media book, and invent some of their own along the way, like 'sealfies.' [...]"
Selected as one of the ten best Canadian feature films of 2016 for the Canada's Top Ten Film Festival in 2017. National Film Board of Canada. "NFB -- Angry Inuk." National Film Board of Canada. http://onf-nfb.gc.ca/en/our-collection/?idfilm=60706. National Film Board of Canada. "NFB -- Angry Inuk." National Film Board of Canada. https://www.nfb.ca/film/angry_inuk/.